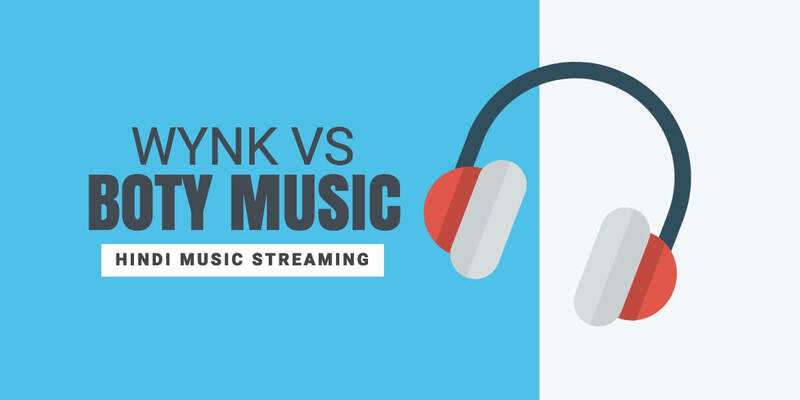 Hindi Music Streaming - Wynk vs BOTY Music? Which is better and Why? The trend for listening to music has taken a sharp turn very quickly. Earlier, people used to buy music CDs or purchase songs. They even used to download the latest songs from hoax websites as and when they released. But now, the online music streaming has taken over all of this. People are now moving towards listening to their songs online. Also, with the Internet becoming cheaper and cheaper nowadays, there is no limit to listening online music. It has in fact opened up wider doors for the public. Now instead of selected downloaded songs, one can listen to a limitless collection of music as per their favorite genre or singer. Wynk is a project of Bharti Airtel. This is one of the best online music player app created so far. Wynk gives you music in over 12 regional languages. If you are an Airtel user, you can even download the song and listen to them anytime. As long as you have an Internet connection, you can enjoy an endless collection of music. Around 12 languages are covered in Wynk. You can sort the songs by your favorite mood or artist. It gives you the various top trending songs lists. You can also create your own lists. Rankings are inaccurate. The songs are ranked based on Wynk’s internal rating system only. It contains a lot of advertisements in between the songs. Only Airtel users can download the songs for free (but with ads). Others have to purchase the subscription. It takes a lot of time to stream music. BOTY Music has recently entered the market for online music streaming. It started with streaming all the latest Hindi songs and soon entered into other languages. It is the initiative of BOTY Movies and Media. BOTY Music was created to provide users with latest song releases ranked according to data from various sources. The music can be sorted based on singers, genres, music directors or producers. Not only that, there are various other lists available too, like Katrina Kaif Songs List. The songs are original and completely un-edited. You can listen to them here for free without any ad breaks. Multiple Hindi, Punjabi, and Bhojpuri songs are available on the website for free. Some special songs lists are also created other than generic singer based lists, like Katrina Kaif songs, and Sunny Leone songs. Latest songs are regularly updated. You can check the top trending songs any point in time. Ranks to the songs are given based on data from multiple sources. The songs are completely free of advertisements. Songs in only 3 languages are covered in BOTY. English songs are not available yet. Creating personal songs lists are not possible. There is no mobile app for BOTY Music. You can only listen to music online. Downloading the music is not possible. If you are an Airtel user and like to listen to downloaded songs without having to worry about the Internet, then go with Wynk. But if you want to check the true rankings of the song and want to know which song is actually trending on charts, nothing is better than BOTY Music. Also, there is an added advantage with BOTY Music. You can also view songs based on certain popular actors like Sunny Leone or Katrina Kaif. There are other apps like Saavn also, which provide quality services. But they come with paid plans for ad-free music.